Cooper can control Spiders in your home! Spiders are a type of arachnid that can be found almost anywhere on Earth, and there are many different varieties spiders that can be found within NJ and PA. All spiders have 8 legs and 2 body parts, but they can come in all different sizes and colors. On the whole they are beneficial, and mostly find their way into homes accidentally. While essentially all spiders are venomous, very few species are harmful to humans, or even capable of biting through the skin. Most spiders will not even try to bite, but if they do people usually react as if they were stung by a bee (some people end up having allergic reactions). For the most part spiders are only in your home because they wandered in unintentionally. Of course, you are more likely to see them in your house if you live in a wooded area or have plant life around your foundation because spiders like to live in these environments. Also, any areas where there is moisture, like basements and gutters, will attract spiders. Essentially, if insects that spiders prey upon are attracted to the area, spiders will follow. Why should I be concerned with Spiders? Most spiders in the New Jersey area are harmless to humans and are actually beneficial since they eat other small insects. However, many people who find spiders in their homes want the spiders removed and to also be controlled in the future. Since spiders are very common, the best way to reduce their presence is to remove their food source. An area that is not hospitable to insects will not be nearly so attractive to spiders. To deal with spiders inside, you can also vacuum with a crack and crevice attachment to remove spiders and their eggs as a quick reduction measure, though the bag should be removed and thrown out right after. Still, the most important measure to keep spiders away is to eliminate their prey insects as much as is possible. Cooper's service for spiders includes knocking down visible webs and providing treatments in areas where there would likely be insect, and thus spider, activity. This will reduce the presence of the insects, taking away the spiders' food source and leading to a reduction in the number of spiders in your home. Spider treatment to eliminate spiders from your home can be preformed as a One Time Service, but it is also covered under the Home Traditional and Home Intensive quarterly maintenance services. How Can I Prevent Spiders? While you are likely to continue to still an occasional spider, there are lots of things that you can do to make your home less inviting to them. Make sure to keep all vegetation, woodpiles, and clutter away from the foundation of your home because they are all ideal spider environments. Also avoid the use of landscaping materials such as riverbed rock as the rounded rocks create a damp cool environment that is favorable to the sorts of insects that spiders often eat. Switching to yellow (sodium vapor) lights can also reduce the number of insects attracted to your home. Lastly, you will want to keep your home as well sealed and free of moisture as possible. Accordingly, you will want to seal up gaps around windows and doors and any other entry points or cracks. Keeping your basement as dry as possible is also helpful. 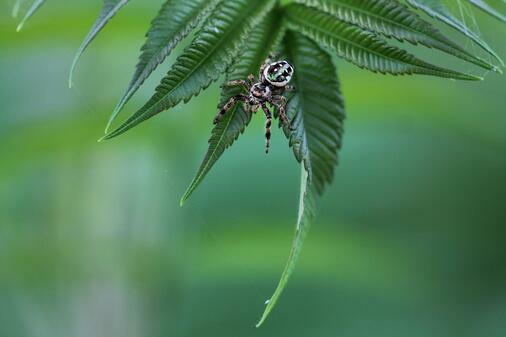 There are many eco-friendly options available for spider control. In addition, all products used by Cooper Pest Solutions are EPA registered for pest control use. Our highly trained pest control professionals will follow all appropriate label requirements in an effort to keep pets and humans safe.